The CFP committee will release their College Football Rankings which has a direct effect on which four (4) FBS programs, oh mis-spoke, which four (4) Group of Five FBS programs will compete for the $50 Million Dollar prize at the end, plus being called National Champion for college football at the NCAA level. I am sorry Houston, even if you are the only 0-loss program left standing at the end of the FBS season before the committee makes thier FINAL selection, you will not be invited and biasly left out based upon your classification status in college football at the FBS level in the NCAA. Eventhough you pay the same memberhsip fee to the NCAA as the Group of Five, you are not part of the “Roman Empire”. If it were me making the selection, you would be the Number 1 seed in the final rankings. The committee released their first rankings last week and I was correct on 96% percent of the selected pool or field with 8% correct on accruate placements. I will work on improving my placement accurcy this week. I selected North Carolina in the pool of 25 and the committee selected Northwestern in the pool of 25. Let’s move to week two (2) for the CFP selection committee and I will continue to make my predictions again with an adjustment to my CFP rankings. I do believe, I have the committee figured out. Intersting, I am not in the room and I can select and rank the CFP Top 25 in a matter of minutes not days. The first rankings were released with all great quality FBS college football programs and then by the following Saturday of college football we had seven (7) of the Top 25 lose. Nerves or did those teams lose to quality FBS programs under the sports quote “on any given day ,at any given time, anyone can beat anyone”. Well that holds true. Here is my predictions, not my rankings, on how the CFP Top 25 will look tonight from the very in-experienced CFP committee. I gave my rankings some thought with this very sensitive ranking subject matter. Rather than rank this group, since $50 Million Dollars is on the line, national prestige and the trophy that comes with it. I used my athletic directors and coaches mind set to rank these teams differently. Why differently you may ask. I believe that with the pressure that comes with college athletics at this level, the money that is involved, very LIMITED access to $50 Million Dollars with 3.6% of the FBS pool being selected and the level of athletic competition; that other factors go into account for rankings. That’s why you see a 0-loss or 1-loss FBS programs lose after the first CFP ranking when you think they should not lose. The loss happens as we saw last weekend when seven (7) CFP Top 25 FBS programs lost due to the level of competition and what is on the line. Their rankings will be effected this week, that’s just common sense. This is my list in alphabetical order and by 0-loss and 1-loss order of FBS programs that I am considering for the four (4) CFP spots to compete for the $50 Million Dollar prize and to be called National Champion in college football at at the FBS level in the NCAA. This list places those teams on notice and does not rank them by order by hiearchal best to worst in which we as a sport society crave to have. We associate our teams by a rank in which they possess when the actual rankings by subjective systems and human voters possess NO true or valid ranking criteria in which to rank them. The rankings are opinion based not criteria based. As for the 2-loss FBS programs, I would say that you are on the watch list. I am well versed in knowing how the final numbers and statistical analysis correalte to final seaon records and how many 0-loss or 1-loss programs will remain at the end of the FBS season. So for this group of twenty (20) remaining 0-loss and 1-loss FBS teams, this is where the field of four (4) will derive from and my mock 16-team CFB playoff selection will derive from, unless we have a very small number of 0-loss and 1-loss programs. If you read and post comments on other web based message boards, specifically sports media, please do not forget to use the APA/MLA citing format. What you post can be found out and thats plagarism. As we head out of turn four of the college football season, the plot thickens. The group of 0-loss programs has been just about cut in half from eleven (11) to six (6) in a mere week. LSU, Memphis, Michigan State, TCU and Toledo fall from the 0-loss ranks. I told you the last four (4) weeks of the college football season gets interesting. I think the CFP committee forgot how the last (4) weeks of college football gets more complex as we head down the stretch. With the various rankings that are published, the sports fans and media are only interested in the one ranking system, that being the CFP poll. It seems that the CFP committee made their first rankings and parts of the sports world in college football and the media were all up in arms with how they ranked the FBS teams one (1) through twenty-five (25) in their first rankings. With LSU losing this past Saturday to Alabama, that leaves the SEC with ZERO 0-loss programs left. Wonder how the CFP committee will select an SEC team into the 4-team playoff if there are four (4) 0-loss FBS teams left at the end of the season? Ranking FBS college football teams week to week is not as easy as everybody thinks. There are many categorical variables you have to look at before you rank teams and rank fairly. You must put aside your favorites and look at the facts and evidence before you rank. As we all witnessed this past Saturday, there were MANY great games played and still many GREAT GAMES to be played. Those great games caused and will cause all the rankings to change with many postion changes this week and in the weeks to come. As for my weekly rankings, each week is more interesting than the last. The rankings change week to week dependant on which group you look at. If I were to compare my rankings to the ones the media posts on the web or news print weekly, mine are different each week. The ones in the print news or websites have more Zero or NO position changes, becuase the voters do not want to change the rank unless they must. Now to my weekly rankings. Ohio State survives and stays atop in both my polls, the PMT and PMT+. As for the remaining spots after that, all the losses by the 0-loss programs caused a change throughout the rankings. Clemson, Iowa and Oklahoma State follow the BIG 10, chasing after them. Clemson beats Florida State, Iowa sneaks by Indiana and Oklahoma State puts to rest TCU. Houston remains the lone 0-loss FBS program from the Group of 5 and hoping to remain a 0-loss program. With three (3) to four (4) weeks left, depending on the conference, there is still some great college football to watch, games to root for upsets and games to see how the last play ends the game. Each Tuesday during the college football season, I will post my CFP rankings and how the committee will rank each week. If you read my postings and use any information from it, please remember to use APA/MLA format and cite your sources. I am beating ESPN and the CFP Committee to the punch and predicting the CFP Rankings from 1 through 25 before they are actually released live at 7PM tonight. Tonight on November 3rd, 2015 at 7PM the College Football Playoff Committee will release thier first CFP Rankings on ESPN, the Expert Sports Programming Network. I follow various twitter accounts that tweet about college football which includes television, radio, analysts and the “experts” at ESPN. Last week the CFP committee Chair, Jeff Long; the Athletic Director at Arkansas an SEC Conference member , The Football Four, and The USA Today Sports sent out a tweet promoting the CFP Top 25 to be released Tuesday November 3rd. I sent a tweet back to them saying that I bet I could predict with confidence who the committee will rank in order and be 90% accurate. I received a tweet back from Jeff Long or his twitter account saying “Go For It! Knock yourself out, have fun with it …Go on! My return tweet was “as Barney Stinson said (from the CBS show How I Met Your Mother) “Challenge Accepted”. Challanege Accepted and Completed. Below is how I believe the CFP Committee will rank the Top 25 FBS college football programs for the first CFP poll. You need to remember that the first poll is not the actual final poll but a feel out poll to see which 25 FBS programs are being considered for the Final Four Spots. This is thier “on thier radar poll”. They will leave some very good credible FBS teams out and off the list. From this list some will play themselves out, some will change thier rankings and some will play themselevs into the poll and fail to receive thier just due credit, also known as any 0-loss or 1-loss programs from the Group of 5. Below is how I have predicted how the CFP Committee will rank the first Top 25 Poll. Disclaimer: This is not how I believe I would rank the CFP Poll. This is a Prediction Model of the CFP Poll. I do believe that the committee has a very hard job to get this right at the end of the year. I also believe the committee does not look at all the variables that needs to be examined to rank more accurately each FBS team 1 through 25. Thier inexperience shows dramatically. What the public also need to rememeber is that there is $50 Million Dollars prize on the table, a trophy and title with national recognition on the line that is attached with this playoff format. This committee does possess vested interest and will do thier best to keep out any Power 5 FBS program out of the Final Four Spots. If you have any questions about my rankings please contact me through twitter at cfbpoexpert or leave a comment on the page. The college football season is now heading into the clubhouse turn and there are still MANY great scheduled games to be played to determine who will be bowl eligible, playoff bound and entered into my mock field of (16) college football playoff format. At the top of my weekly rankings nothing has changed, Ohio State and Michigan State are split at Number 1 and Number 2 atop the PMT and PMT+ polls. There was some shuffleing among the other (23) ranked FBS teams. Both had bye weeks this past Saturday as they head into the final (4) game run to end the college football season at the end of November. There are probably still 50+ great games scheduled that are going to determine who’s in and who’s out of the playoffs. The American Athletic Conference (AAC) has been playing very competitive college football and are not receiving any credibility from the sports media except for the small interests showing. And when the AAC teams lose or fall from the 0-loss rankings, the media loses interests or comments with the “I told you so” comments. Temple (7-1) fell from the 0-loss list after losing in the last 2-minutes to Notre Dame 24-20. Houston (8-0) slaps the Schedule Easy Conference around by shutting out the “great” SEC and Vanderbilt 34-0, to remain in that 0- loss group. Memphis (8-0) starts slow versus Tulane (2-6) but finishes strong to show they belong in the CFP talk. Finally, Navy (6-1) increases thier chances to stay in the 1-loss group. If I recall is not the AAC (2-1) versus the Schedule Easy Conference (SEC) and should be by all rights be (3-0) versus the SEC. Wins versus a pre-season ranked Mississippi, a dominating win versus Vanderbilt, Missouri stuggled to win verses Connecticut by kicking the winning field goal at the end of the game and an added note of Toledo (7-0) going into Arkansas and winning. The fans and Schedule Easy Conference media, staff and coaches say “top to bottom” the SEC can beat anyone and anytime. What’s it like to eat crow? The AAC and Group of 5 FBS members belongs in the discussion of the CFP committee and one of those 4-spots. What the main stream media fails to understand is their are (128) FBS programs, (10) Conferences and (3) Independents competing for the (4) CFP positions but the CFP is only monitoring or selecting from the Power 5 FBS group. No matter what Memphis, Houston or Toledo do this season and remain a 0-loss program at the end, they will never get a “fair and just” opportunity to compete for the $50 Million dollar prize and the right to be called national champions in college football at the end of the season come January 2016. Listening to ESPN radio, or ESPN TV the media members on the air or behind the scenes have been brain washed that only the FBS programs from the Power 5 are “entitled” to compete for that prize. I would love the opportuinty to call into one or all of those ESPN radio or TV shows, ask multiple questions, serve and volley in an intellectual manner and watch thier heads explode with the knowledge and how well versed in this topic I am. Enough for now.. on to the rankings and numbers. As of November 1; there are (41) FBS programs that are bowl eligible with upto (17) more possibly eligible in the next two weeks. There are now (11) 0-loss FBS members remaining, (11) 1-loss FBS members and (15) 2-loss FBS members. Intersting how the games play themselves out and that the media are only using “crystal ball” methods to impose thier “expertise” on the topic of college footbal of who’s in and who’s out. Another interesting statistic is there are (2) 0-win programs left; Kansas and Central Florida. Will they remove the (0) from the win column? As of November 1, 2015 here are the (2) groups of standing of my PMT and PMT+ polls. The college football season the next 4 weeks will be the most exciting part of the season, rivalries, great conference games and lots of upsets and programs you thought would be in the playoffs now out of the disussion. With the college football season working itself towards the finsih line the Big 10 are still atop my polls with Ohio State No.1 the Professional Model Theory poll (PMT) and Michigan State No.1 in the Professional Model Theory (PMT+) poll plus one other categorical variable. The Atlantic Coast Conference (ACC) finally cracks the Top 5 of the PMT+ poll with a dominating win against Miami (Fla). Sandwiched betweened Michigan State and Clemson are; Ohio State, Toledo and Temple. In the PMT poll, Temple, Toledo and Memphis follow behind the Big 10. It seems that the AAC and MAC are keeping pace and climbing within both polls to keep pace with the Big 10. The true Test for No.3 Temple (7-0) will be this week versus Notre Dame (6-1). The college football season has always been an exciting season once we arrive at the half-mile pole of college football. Georgia Tech beats Florida State on a special teams play on a blocked field goal attempt. It seems that at this point of the college football season, its always the un-predictable time of the year. What the experts predict on outcomes of this college football season are usually wrong, thats why they are the experts. I let the games play out before I make any assumptions on who should be ranked or considered for the playoffs, unless my intuition tells me something. As of this current point in the college football season there are tweleve (12) 0-loss FBS teams, thirteen (13) 1-loss FBS teams and sixteen (16) 2-loss FBS teams. These groups will dwindle down, they always do. It’s what my research tells me.Of those (12) 0-loss teams 25% are from the Non-BCS or Non Power 5 Conference; Temple, Toledo, Memphis and Houston. In the coming weeks, the AAC members will soon be scheduled against each other. Of the (13) 1-loss teams; 2 are from that same group of Non-BCS or Non Power 5 conference members; Marshall and Appalachian State. As the college football season progresses forward, the month of November is going to be the most entertaining month for college football, that’s always the un-predictable month. Not sure what to expect but to expect the best games of all to be played. We have 0-loss programs that were not expected to be there at this point of the season from the sports media, and are just now receiving small credit from the media. I wonder what will happen if the only 0-loss FBS team remaining is from one of the Non-Power 5 or Non-BCS Conferences. We know they will be left out of the so called “playoffs” from the very inexpereicned playoff committee. With $50 Million dollars on the playoff table the committee will ALWAYS favor the Power 5 or BCS conferneces and programs. We will watch how the remaining 5 weeks of college football plays out. The scheduled match ups we are wanting to see play, are arriving soon. Be prepared for some upsets and close games. And now to this weeks rankings. The rankings seem to change on a weekly basis with teams moving up and moving down. What remains the same is that the Big 10 are still atop of both the PMT and PMT+ polls. What does remain the same is that the SEC has only (1) 0-loss team left and thats #6 LSU in both polls. Here are my FBS college football rankings based upon my research. To all the college football fans who would appreciate an expanded tournament style playoff bracket of more than 4 Power 5 FBS teams in the NCAA at the FBS level of college football. I authored and released a book in 2013 which is pictured on my webpage on the right side. I have taken on the subject matter again and that book although available now but not the one you should read. Proof reading what I wrote, I discovered that I left out some vital and pertinent information that is definatively needed to prove my point and support for a change for a 16-team playoff expanded format for college football at the FBS level of play in the NCAA. 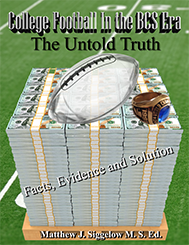 My research and playoff format allows all (128) and or future FBS programs an equal, fair and just opportunity to compete for the National Championship in college football at the FBS level of play in the NCAA and an opprtuinity to comepete for $50+ million dollars. I have added 4 new chapters, added new tables, adjusted tables and data to support my findings, a secret chapter and changed the title. I am currently writing that secret chapter now which offers evidence and proof that certain rules have been broken and that those rules need to be brought to light. I am writing this book from a District Attorney’s positon who is trying a defendent on a first degree murder charge and I am that District Attorney with all the evidence and facts. When you author a book and make any changes to that book, such as additional chapters or change in data, you need to re-apply for copyright protection and a new ISBN Library of Congress number. This does not mean that the book I authored already is not valid, just means that I am offering more supportive evidence and findings. You may ask why the long delay in re-release. When you work 70+ hours a week, you have time for a few pages here and there plus reflect on what you wrote. My target time to be completed with this project from the writing sense is at the end of 2015, basically December 31, 2015. Once that is complete, I will proof read what I wrote again and then re-submit for copyright protection by the end of January 2016. Once I have obtained my new copyright, I will be looking for at least (20) volunteers to enter into a contractual agreement to read my book to offer thoughts and comments. The target date for consumer purchase will be on or just after July 1, 2016. Right before college football season starts up with the pre-season polls and conference media days. The volunteers I am searching for are sports writers from across the country, atheltic directors outside of the FBS or FCS level of play, sports fans who possess an open mind and passionate about college football when reading a topic of this magnitude, sports news casters who possess no ties to ESPN, FOX Sports, HLN Sports, NBC Sports, CNN Sports or any other major media sports outlet. As a volunteer you will enter into an agreetment that hold you to secrecy and not able to discuss the book and its contents until I officially release it to the general public. Specific details of being a volunteer to be the first to read my book will be released later when that time comes. I look forward to your comments and the possibility of you being one of those (20) volunteers. It’s mid-October and we are about at the half-mile pole for college football with the cream slowly rising to the top, others gaining ground and some slipping into the pack. Of the field of (128) FBS programs, there are NO Secretariat’s in this group. Ohio State remains number 1 in both of my polls. Michigan State is a close second but actually stole a victory to stay at (7-0) and with pace with Ohio State. The Big 10 has established thier dominance this year but that can change as we head into the last half of the college football season. Utah, Temple and Toledo all exchange places as they settle in behind the leaders in the third through fifth positions. The college football season has had many great games and non-historic FBS programs earning success this season, but not receiving the media credit coverage from print, radio and televised media that they deserve. Congratulations to Memphis at (6-0) from the American Athletic Conference(AAC), a Non Power 5 or Non BCS conference member. Memphis started out being ranked in my polls at 10th and 11th, then 8th and 11th, last week 10th and 12th and this week 8th and 10th. Memphis has been consistant all season long, but no real mention in the media until now. Yesterday, Memphis earns a program and conferene credibilty win against SEC member Mississippi. If I recall, was not Mississippi now (4-2), ranked in the top 10 in the preseason polls by the so-called experts and sports media.The only credit Mississippi has to thier credit is the win against Alabama. And NOW ESPN’s Mike and Mike and other college football shows in the sports media in print, radio and television are now showing slight interest. Seems that Memphis deserves more credit that what the media are offering. This also includes Toledo, Temple, Navy, Houston and Utah; they too deserve more media coverage. Oh wait, Toledo, Memphis, Houston, Navy and Temple are not Power 5 Conference members and are left on the back burner. Interesting that they pay the same NCAA and conference membership fees like the Power 5 conferences, compete on the same field of play as them but have to wait to receive media credibilty. That’s like the Kansas City Royals who have won the AL Central and hoping to play in thier second consecutive World Series. Interesting analogy is that the New York Yankees make the most money for MLB but finsihed behind Kansas City this season. Guess who is playing for the possibility to play in the World Series, not the Yankess. The Royals players and coaches EARNED that spot these past two seasons, not given to them. Maybe the sports media should immediately recognize when non-primary or Non-Power 5 FBS college programs are doing better than thier crystal ball expectations and predictions from the media and give them thier just due credit. And now to this weeks rankings. There have been a few changes with FBS teams moving up, some moving down. As of the half mile pole of the FBS college football season there are (14) 0-loss and (15) 1-loss programs left in FBS colege football. From the 0-loss group; (12) are from the BCS/Power 5 Conferences and (4) are from the Non-BCS/Non-Power 5 conferences. Those (4) are Houston, Memphis and Temple all from the American Athletic Conference(AAC) and Toledo from the Mid-Amercian Conference(MAC). We know that only (1) from the AAC could emerge as the only 0-loss FBS program and still no media coverage. Below are the current rankings based upon my research and assessment on how college football should be ranked; not by popularity, confernece affiliation labels by the sports media mean nothing to me or which FBS progam generates the most revenue dollars is a non factor. Finally, congratulation to Appalachian State from the Sun Belt Conference (SBC) for cracking my Top 25. I hope they continue their success and end up at (11-1). We shall see. The remaining last half mile of this college football season is going to get very interesting with upsets, great games. close games and a wire finish in the last 2-weeks of the season. Some that are ranked in my Top 25, are more than likely not going to be there in the last poll. If there was a 16-team playoff format based upon my research findings and my book; the group of (29) FBS programs with 0-losses and 1-losses are 100% guarenteed a spot in the field of 16 when the final season completes itself. That means at the end of the FBS season, any 0-loss or 1-loss FBS program are guaranteed a spot in my field of 16. The group of (22) FBS programs with 2-losses have an 83% chance of making the field of 16. We shall see how the last half mile plays out. Week three (3) of my college football polls have been interesting to compute, analyze and watch the many changes in positions occur as I collect the numerous amounts of data. Not much has really changed in the top spot of both of my two (2) polls. Ohio State (6-0) still remains as the number one (1) college football program in both polls. The next two (2) spots changed from the previous week with Michigan State and Florida battling it out for the ranking of 2nd and 3rd. In addition to Temple and Utah holding on to the 4th and 5th spots in Group 1. In the Group 2 rankings Michigan State and Florida change spots as well as Temple and Utah. There are many newly ranked FBS teams which I knew would make the rankings once the season started to get deeper into the college football season. As you read through my Top 25 rankings there have been some position changes both up and down. As of this week in the 2015 college football season we are now down to (16) 0-loss programs and (20) 1-loss programs. This is due to the fact that the college football season is heading into conference play and conference play gets very competitive for all conferences, not just the Power 5 or BCS conferences. What my rankings offer is that all 128 FBS programs have an EQUAL opportunity to be ranked, not just the Power 5 or BCS conferences and schools. This weeks rankings have every conference representation all except the Sun Belt Conference (SBC). The closests SBC member is Appalachian State at (4-1), which is in its second season as an FBS member and ranked number 32 out of 128. They have an outside chance to make my Top 25 and possibly make my field of 16 if they remain as a 1-loss FBS team. Here are my week six (6) college football Top 25 rankings in both groups. Group 1 is based upon the professional model theory and Group 2 is the professional model theory plus one additional categorical variable. I look forward to observing and anayizing how the remaining weeks of college football at the FBS season plays out. You might be surprized at how I believe the outcome will turn out. FBS programs are (90-9) this 2015 FBS season with a win-loss percentage rate of (.909). Of those 90 wins by the FBS programs 74 have been won by 3 or more possessions. The FBS has outscored the FCS programs by a combined total number of 3041 points. The winning margin of victory by the FBS programs over the FCSprograms is consistent with and supprts my research by more than 4+ possessions at 30.7 points per game. The FBS programs are scoring on average 45.2 points per game, while the FCS programs are scoring on average of 14.5 points per game. There are 7 FBS/FCS scheduled games left in the 2015 FBS season; 4 for the SEC, 2 for the Independents and 1 for the ACC. Lets see how much further the statistical analysis gaps change and grow for the FBS programs between the FCs programs. Week 5 of college football produced some changes, surprises, and FBS programs that the sports media experts probably did not know would still be part of the 0-loss group. The Clemson/Notre Dame, Michigan State/Purdue and Ohio State/Indiana were great games and even close to being upsets.There are other great games that were played on college football Saturday.These just came to mind as I was preparing this post. As of this week in CFB we currently have (20) 0-loss programs and (26) 1-loss programs. Next week we should see a 1-loss FBS program(s) reach my Top 25. As the CFB season progresses the rankings will start to almost look identical with some position differneces which are closely related to one another based upon the data and analysis used to determine the rankings. This means qauntifiable data and the professional model theory offer a true validity to reality in ranking CFB FBS programs. The human subjective polls and the (5) computer models are easily manipulated and lck quantifiable variables that were either left out of the mathematical equation on purpose or failed to think of those negative variables. I did receive some feedback of both positive and negative on my first rankings. I thank you for the comments. I have made some slight changes in how the rankings will be posted, since many of you view web pages via your cell phone. However, this page is best viewed on your laptop or desktop screen. How to review the rankings of both groups. FBS teams will be listed left (1) through (25), current overall record and postion difference from the previous week in which I ranked the FBS programs (1) through (25). The Next Five group are the FBS programs just out of the Top 25. Group 1 are my rankings based upon the professional model theory and Group 2 are ranked using the professional model theory, plus one more quantifiable variable. As the CFB season progresses, the overall records will become more equal based upon total number of games played. From this group of 46, which will dwindle down to a group of 16 and will make up my playoff field of 16. Its too early to tell who will make the group of 16, let alone how the experts can verbalize who are the 4-teams in the College Football Playoff. I do not have a crystal ball like the sports media experts. These rankings possess no bias or favortism towards any of the (128) FBS programs that compete in college football at the NCAA level. These ranking are researched based and quantifiable categorical variable related. Please offer any and all feedback to me in which group you like most based upon what you see through this website or send me comment on twitter. Do share these rankings with your college football fans, friends and any sports media members you may know. I will post these rankings every week and now will make every effort to publish ra these rankings by 12 Noon on the following Sunday after college football Saturday. The college football season is now 4-weeks into the 2015 FBS NCAA season and now its time for a true and more accurate Top 25 rankings. From this point of the season until the last regular season games, I will post two (2) Top 25 rankings with the next five (5) ranked. These Top 25 rankings are based upon criteria based research in which the rankings should be competed. The rankings should not based upon conference affiliation, which coach is voting for whom and no manipulation of the ranking to keep specific FBS programs out of a ranke spot or give more credit than due to other FBS programs. To me the rankings are earned by the players and coaches on the field in relationship to the criteria I have developed. The current Amway USA Today College Football Top 25 are all opinion based and lack no true validity to the rankings. Ranking Group 1 is based upon the professional model thoery. Ranking Group 2 is based the professional model theory and other data. The FBS season is only 4 weeks old these rankings will significantly change over remainder of the collefe football season. As of this date, FBS level of college football possesses (29) 0-loss programs and (27) 1-loss programs, From this group of (56) will come my field of 16. Here are my Top 25 rankings for this college football season. These rankings possess no bias or favortism towards any of the (128) FBS programs that compete in college football at that level. These ranking are researched based and quantifiable categorical variable related. Please offer any and all feedback to me in which group you like most based upon what you see through this website or send me comment on twitter. Do share these rankings with your college football fans, friends and any sports media members you may know. I will post these rankings every week and now will make sure that the rankings are out by 12 Noon on the following Sunday after college football Saturday.